Egg recipes have been a part of mans diet since very early times. The good egg is one of our most versatile foods. It is perfectly formed and prepackaged. The egg supports the world of gastronomy. No other food contains so many nutrients essential for life. It is high in protein and fat as well as calcium, iron and vitamins. The nutritional qualities alone are so remarkable that the egg ranks as a top product worldwide. Especially at Easter the egg is celebrated as a symbol of spring, fertility and everlasting life. Most cooks and chefs consider the egg so indispensable that many have created special egg recipes. Wild bird eggs were a source of substance for the primitive man but the domestication of fowl began to ensure a more predictable supply of eggs. Chickens are a productive layer and selective breeding has helped to increase their output. It was increased further by mass production in the United States. A top quality chicken egg will have a firm round yolk surrounded by a white thickness. Almost twenty percent of the yolk is protein while ninety percent of the egg white is water and the rest is protein. A uniform grading system takes the guesswork out of how many eggs to go into your egg recipes. Eggs sold at retail are classified according to size and graded for quality and freshness. Most recipes call for large eggs so some adjustments might need to be made if you have other sizes. 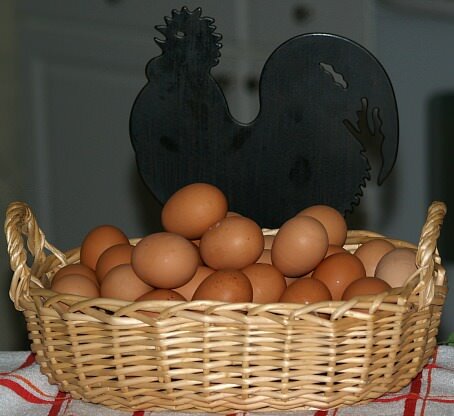 Extra large eggs average 27 ounces per dozen; large has 24 ounces per dozen; and medium has 21 ounces per dozen. The quality is gauged by checking the shell for cleanliness, shape and smoothness; inside is checked by lighted racks for firmness of the yolk, thickness of the white and amount of air in the egg. The best egg is graded AA, the next best is A and the eggs with enlarged yolks and thin whites are graded B and are not usually available in stores. Eggs should be eaten as fresh as possible. Generally speaking, the spoiling of eggs is due largely to exterior bacterial infection. If you buy eggs directly from a farm, it is best to clean them before storing them. To store eggs, place them in the refrigerator large end up. If possible use the eggs within a week. I have bought fresh eggs and used them for weeks without having any bad eggs. I have been told of people placing whole yolks in a container with water and refrigerating for a few days to save them. I have not tried this but I have saved yolks in a cup stored in the refrigerator for a couple of days and then made noodles or other egg recipes and there was no problem with the yolks. Whites of the egg can be saved for up to two days in a covered container in the refrigerator or placed in the freezer for longer storage. Some people store the whole good egg by opening the egg in a container and with a fork blending the white with the yolk. Add ½ teaspoon salt per cup of eggs. Cover and freeze. There are few ingredients that can be used in as many different ways as eggs. No matter how you are using eggs, they need to be handled with care. They should be broken carefully so as not to get any shell pieces in the egg. When separating the white from the yolk, this also should be done carefully. If using whites for a meringue, a little yolk will prevent the white from whipping up. Actually the only time you can be rough with an egg is whipping the whites into a meringue. Learn how to boil eggs and cover it with sausage. 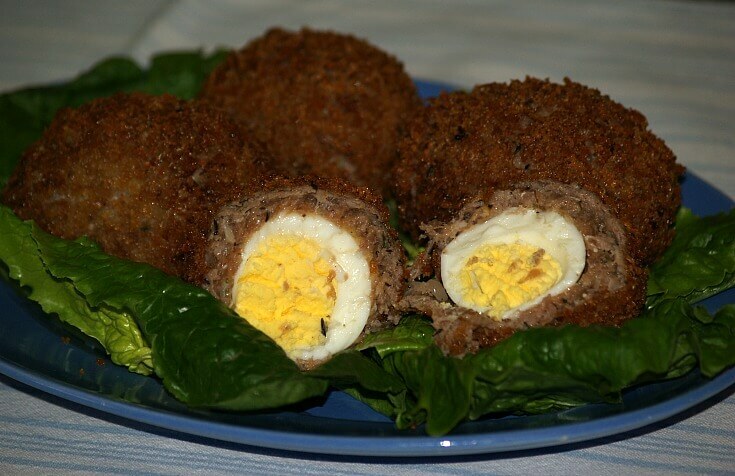 This egg recipe is famous in the United Kingdom. Combine sausage, sage, parsley and thyme; set aside. Combine and blend flour, salt and pepper; set aside. Pack pork mixture into 8 rounds; surround completely each cooked egg with pork patty. Roll each egg in the flour mixture, then in egg and finally in bread crumbs. Fry in hot oil for 10 minutes until pork is cooked; serve hot or cold. NOTE: You can cut into halves or quarters to serve. This is a family favorite egg recipe. Often these are in the are in the refrigerator for a healthy snack or quick meal. 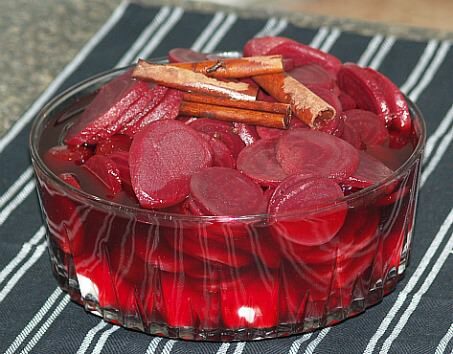 Combine beet juice, vinegar, sugar, allspice, cinnamon, cloves and celery seed in a saucepan. Bring mixture to a boil; reduce heat and simmer 5 minutes. Place eggs in a large bowl; dump drained red beets on top of eggs. Pour hot spice mixture over the beets and eggs; let set to cool to lukewarm. NOTE: These are better if refrigerated overnight. In a small mixing bowl beat eggs until foamy; add unprepared muffin mix and blend thoroughly. Add corn and desired fillings blending well. Spoon about ¼ cup of batter for each cake into hot pan. Serve with sour cream and salsa; makes 4. FILLING SUGGESTIONS: chopped ham, diced cooked bacon, thinly sliced green onion, mushrooms, red or green chopped peppers. Fry sausage in Dutch oven until done; add onion, bell pepper and chiles and sauté until tender. Add potatoes and cook until tender (if too dry add a little water). Pour eggs and 2 cup cheese on top; stir until done to taste. Fill warm tortillas with mixture; top with more cheese and salsa. This is one of the best egg recipes to make ahead when expecting company for breakfast. Pour melted butter in a 9 X 13 inch cake baking pan; cover with brown sugar. Place a layer of bread as close as possible over the brown sugar. Sprinkle the cinnamon and raisins over the top; cover with another layer of bread. Combine and mix in a bowl eggs, vanilla and milk; pour over top of bread. Wrap tightly with plastic wrap; refrigerate overnight. The next morning bake in preheated oven at 350F degrees for 40 minutes. Let stand 5 minutes before cutting; turn piece upside down on plate (makes its own syrup). Scramble eggs in a mixing bowl; pour into a greased frying pan. Cook over medium heat for 1 ½ minutes until eggs start to thicken. Add meat, pepper, onion, tomato and cheese. Mix and cook until eggs are thoroughly cooked; top with salsa to taste.